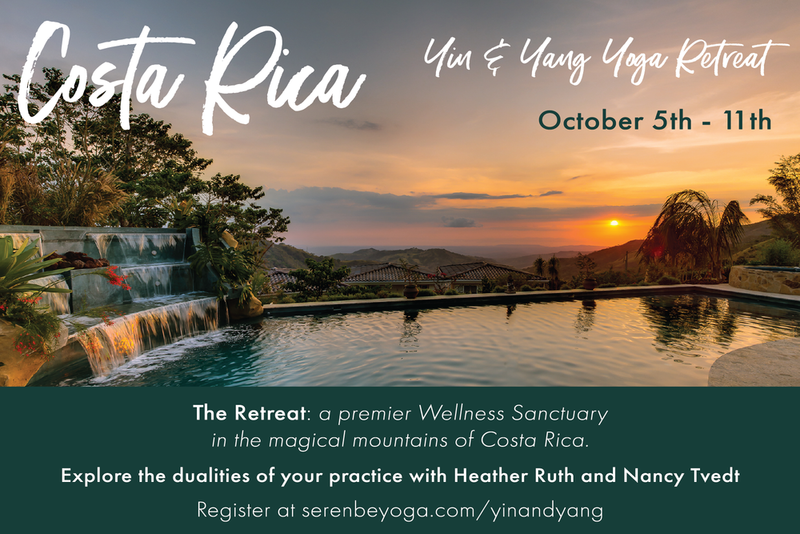 Yin and Yang with Heather Ruth and Nancy Tvedt in the magical mountains of Costa Rica. THE RETREAT. Costa Rica’s premier wellness sanctuary and one of the Healing Hotels of the World. A luxurious boutique hotel nestled in the stunning beauty of the Costa Rica Jungle. Offering organic farm to fork cuisine and “farm to spa” treatments. A dedicated yoga house, an outdoor pool, jacuzzi and steam room compliment the stunning guest rooms. Explore the dualities of your practice and find balance before the mayhem of the holiday season. Invite the Yang, and begin each day with an energizing Vinyasa yoga practice. restore physically and spiritually. Be inspired for what lies ahead! A typical day will include: Wake up to the bird song and gather for a 20 min breath work and meditation practice, followed by energizing Vinyasa flow yoga. Spend your day lounging poolside, hiking the beautiful mountainous rainforests surrounding the property, and/or finding your bliss in the Spa (Learn More). Reconvene each evening for a restorative Yin practice including elements of guided meditation, essential oils, and Thai Bodywork to wind down from the day. Each evening we'll share a communal dinner together followed by fireside chats. Morning meditation and 2 tailored yoga classes daily. A fiery start to the day and restorative evening practice. Deposits are not refundable. Cancellations prior to July 1 will result in forfeiture of one half the price. Cancellations after August 1 will result in forfeiture of entire amount. Air Transportation – flights should be arranged to San Jose International (SJO), Costa Rica. Ground and Air Transportation - transportation to and from THE RETREAT can be arranged with the resort and paid via room charge. Ground Transportation - private SJO transportation to and from THE RETREAT can be arranged with the resort and paid via room charge. It is approximately a 45-minute drive to/from the airport. Please schedule your arrival no later than 4:00pm on 10/05 and departure after 10:30am. Nancy Tvedt, ERYT500. After a successful career in the business world, Nancy has found her passion on her yoga mat. Nancy currently teaches at YogaWorks, Atlanta and leads yoga retreats in many interesting locales, most recently India and Italy. Nancy appreciates the physical discipline of yoga but more importantly values the inner well-being that has evolved with a consistent yoga practice. Forever a student on the mat, Nancy has advanced her practice delving deeper in the yoga philosophy and exploring various disciplines beyond Vinyasa including Ashtanga and Anusara. Nancy’s soulful yoga classes will challenge your physical strength and flexibility as well as open your heart and quiet your mind. Her wish to you is to walk this earth with grace and strength. After leaving a high stress career that left her sick and tired, Heather made her way to teaching yoga. Her journey to yoga began as a way to manage stress and gain physical strength. She received her Thai Yoga Therapist certification and 200 RYT in Costa Rica. Heather specializes in Restorative Yoga, and incorporates elements of Thai Yoga into the classes she teaches. She is also a certified Aerial Yoga Teacher, and will be teaching Restorative Aerial Yoga. As the proud Mom to 5 Nigerian Goat "kids" (in addition to 22 year old daughter, Madison), most weekends Heather can be found teaching Goat Yoga at The Animal Village at Serenbe. Heather's classes are light hearted and meditative in nature.